Langtang Gosaikunda trek offers to see the marvelous views like Ganesh Himal, Manaslu, Annapurna Massif, lifestyle of Tamang and Sherpa people and the cultures. Most importantly you get to see the holy lake called Gosaikunda which lies north of Kathmandu. Gosaikunda has a great religious value among the Hindu people and they visit the lake every year during a full moon day which falls on August. It is believed that God Shiva of Hindu can be seen in the middle surface of the water. We drive to Syabrubesi through Dhunche by a local bus which takes about 6 hours and stay overnight in a hotel in Syabrubesi. We trek to Lama Hotel from Syabrubesi then the trail crosses the Bhote Khola using a suspension bridge and continues east. The trail starts as a moderate climb and zig-zags up the broad valley. Continue up you will see the village of Thulo Syabru clinging to the high valley side. The trail enters a deep gorge, which signifies the start of the Langtang valley. Red pandas and Langur Monkeys inhabit this forest. After this you will briefly climb out of the forest to reach the village of Lama hotel and stay overnight. Leaving lama hotel we climb up the Langtang valley and the area is still forested and again you might catch a glimpse of a red panda. After a short while the mighty peak of Langtang Lirung comes in to view from the north passing a waterfall you continue of the west bank of Langtang khola and pass through the hamlet of Gomnchok. After a couple of hours the valley begins to widen out and the trail flattens. you will trek past the national park check point and then cross a small wooden bridge and continue through the forest approaching Langtang you will see a 400 year old Buddist Gompa (monastery) on your left and a few minute later you climb into Langtang village itself. From Langtang you continue up the ever-widening valley to Kyanjing Gompa. After passing through the upper Langtang village you will walk past a series of long many walls to your east you will gain great view of the peak Dorje Lakpa with Urkinmang to its left also, to the south the peaks of (Naya Kanga) and (Pongen Dopku) will come into view after a steep, Kyanjing Gompa to Yala-Kyanjin Gompa:Climb for three hours to reach Yala rest or proceed for a short walk to views of Langsisa Himal, Bhairab Takura and Dorjee Lakpa mountains and Yala and Lirung glaciers. Trek back by the same route. We trek down to Syabrubesi from Lama Hotel, if we save the time we will get to Dhunche, if not we shelter to Syabrubesi. This is a day when we head to Singgompa which is the main attraction at Chandanbari. It is situated on the elevation of 3250 m. where we can get several lodges and a small cheese factory, we stay overnight in Singgompa. From Singgompa the road gently climbs up to Gosaikunda. On the way to Gosaikunda you can see the beautiful scenery of Langatang valley, Langtang Lirung, Manaslu, Ganesh Himal etc. 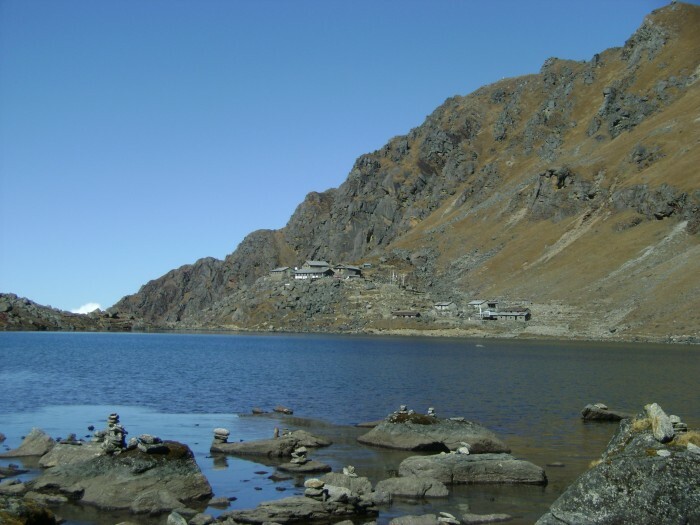 Gosaikunda is considered as holy lake where people come to take bath which is believed to remove the sin from the soul. It is on the elevation of 4380 meters which is the main of destinations of this trek. After spending a wonderful night in Gosaikunda we back to Dhunche. We point the places on the way back which might have been missed while climbing up. After we get to Dhunche we stay overnight. We drive to Kathmandu from Dhunche by local bus which takes about 6 hours and stay overnight in a hotel in Kathmandu. Arrival and departure transportation, Kathmandu/Syabrubesi/ and Dhunche/Kathmandu by bus, 2 nights hotel accommodation in Kathmandu, in trekking food ( breakfast, lunch and dinner ) with accommodation , trekking permits, TIMS , guide, porters, their food, salary and insurance.